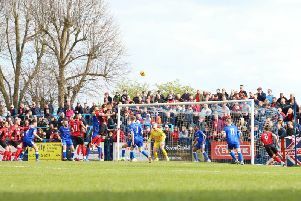 A season that promised much actually ended in a bit of an achievement for Kettering Town. Almost a year ago, Lee Harper was given the backing to build a squad good enough to challenge for the Blue Square Bet Premier play-offs and by the time the campaign kicked off, it looked like he had done it on paper at least. But, as seems to be the case with the Poppies these days, it was never going to be that simple. A season-ending injury to striker Moses Ashikodi helped contribute to a miserable first month that ended with Harper being sacked after a 1-1 home draw with Wrexham. Morell Maison made the briefest of returns as caretaker-manager to steady the ship while a new boss was sought. And there was pretty much shock all round when it was confirmed that Marcus Law, the man who had led Barwell on an incredible run in the lower leagues, would be Harper’s replacement. The impact was immediate as a home victory over Hayes & Yeading helped continue a good unbeaten run that was ended by Rushden & Diamonds’ FA Cup win at the Elgood’s Arena. That game proved to be a turning point. A big loss of form, which included a shock defeat to Chasetown in the FA Carlsberg Trophy, came at the same time as chairman Imraan Ladak confirmed the budget would be reduced and the wage bill cut. The likes of John Dempster, James Dance, Luke Graham, Greg Taylor and Andre Boucaud all left as a result and it was left to Law to rebuild a squad with non-contract and loan signings. A historic 2-1 win over Diamonds at Nene Park thanks to Iyseden Christie’s two goals helped lift the spirits as did the appointments of club legend Roger Ashby and James Ellis as assistant-manager and head coach respectively but after a 2-1 defeat at Grimsby Town, the Poppies were 17th and staring a relegation battle in the face. But Law and his players won the key matches when they needed to. Back-to-back wins against Eastbourne Borough and promotion contenders Fleetwood Town took the pressure off and it soon became of case of seeing out the season in a comfortable mid-table position. The Poppies owed a lot to Jean-Paul Marna for 19 goals in his best season yet while the emergence of Marcus Kelly as a left-back and the consistent efforts of the old warhorses Brett Solkhon and Ian Roper didn’t go unnoticed. It also must be made clear that those who came in on loan showed the right commitment to the cause. But it was Law who stole the show. Not just for guiding his team to safety after such a big turnaround but more for the way he conducted himself when literally everything was going against him. If the off-field issues, including the ground problem which is still being worked on as the club looks to secure a new lease, can be resolved and Law gets the right backing, there is no reason why he can’t lead the Poppies to good things in the future. He has earned the right to start the new season with a clean slate. He has said that is all he wants and after rescuing what looked like a hopeless situation, it is the very least he deserves. Of course, a lot lies in the hands of Ladak, who has already held talks with the Kettering Town (Poppies) Supporters Trust over their future involvement. One thing is for certain, whatever happens it’s bound to be interesting.